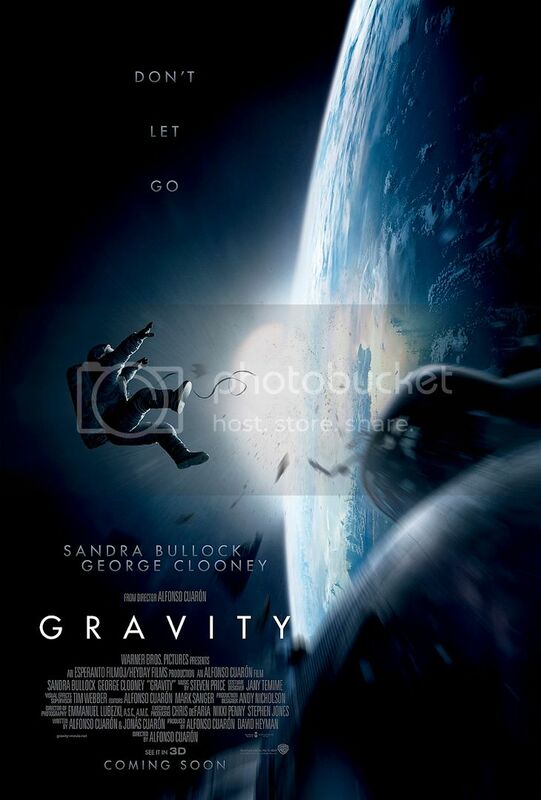 Last week, I watched the Alfonso Cuaron movie Gravity at TGV in 1Utama. Initially, I was not sure I wanted to watch it, especially since I heard that there are only 2 actors in the whole movie. How good can a movie be with just 2 actors in it right? But the reviews were mostly good and the movie had been sitting on top of the US Box Office for 3 straight weeks, so I decided to give it a go. Turned out, it was the best decision I made. I have to say it's one of the best, if not the best movie of 2013! 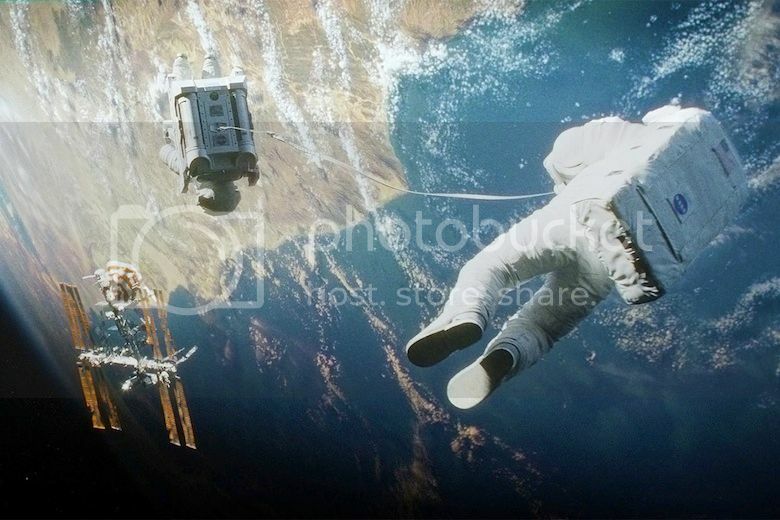 I watched Gravity in IMAX 3D and boy, was it spectacular or what! If you plan to watch this movie, make sure you watch it in IMAX 3D. I would even go so far as saying that Gravity is probably the one movie that fully optimize the IMAX 3D medium to date. If you have not watched the movie yet, here's the trailer to entice you. Although Gravity is a sci-fi thriller movie, it is in fact more about survival and the human spirit. 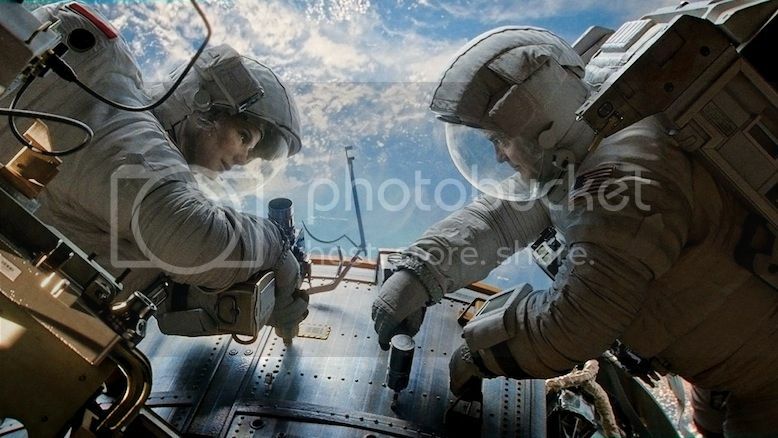 Basically, the story is about 2 astronauts on a mission to repair the Hubble Telescope. Dr Ryan Stone (played by Sandra Bullock) is a medical engineer who recently lost her daughter and she's on her first shuttle mission. Lt Matt Kowalsky (played by George Clooney) is a veteran astronaut, who is commanding his final expedition. By the way, don't you think Ryan sounds more like a man's name? Everything seems fine until a warning comes from NASA that debris from an exploded Russian satellite is hurtling towards them. They have to get out of the way, but too late! The debris hit their space shuttle Explorer and Stone is flung into space. The scene where Stone was tumbling helplessly in space all alone was pretty scary to me. 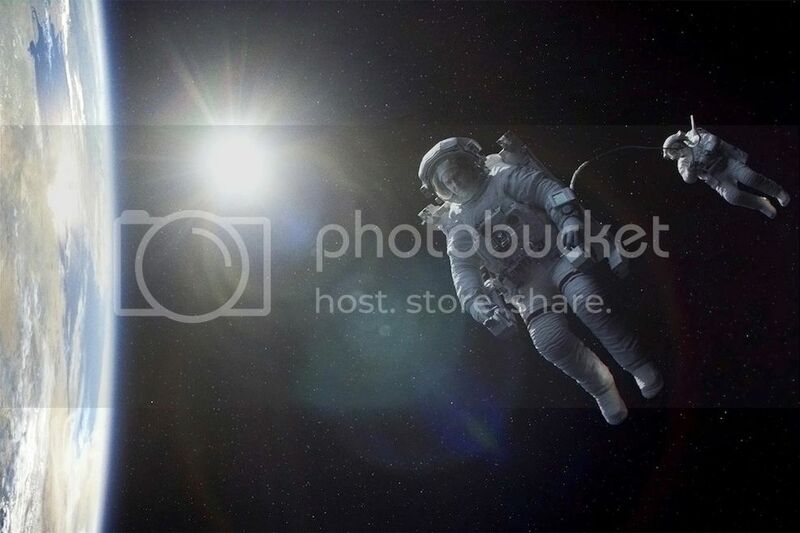 Imagine floating endlessly in space with no one around to save you. Even worse, Stone loses all contact with Kowalsky and her oxygen supply is dropping. Luckily for Stone, Kowalsky manages to locate her and bring her back to the Explorer only to find the shuttle badly damaged and all the crew dead. With the help of Kowalsky's thruster pack, they make their way to the International Space Station (ISS) which is about 100 km away. The problem is they only have 90 minutes before the debris completes an orbit and threatens them again. I enjoyed watching the part where Stone and Kowalsky are making their way to the ISS. Many may find this part of the movie boring as both Stone and Kowalsky are having conversations about their private lives. But I like that during their conversation, the radio Kowalsky is listening to is blaring some nice country music - I do not know how to describe it, but I just find that scene mesmerizing. Remember I said I almost gave this movie a pass because it features only 2 actors? Well, guess what? At the ISS, tragedy struck and to cut the long story short, Kowalsky becomes a hero by sacrificing himself so that Stone has a chance to survive. So for the rest of the movie, we are left with only 1 actor! Gasp!! What happens after that is no less intense and gripping. 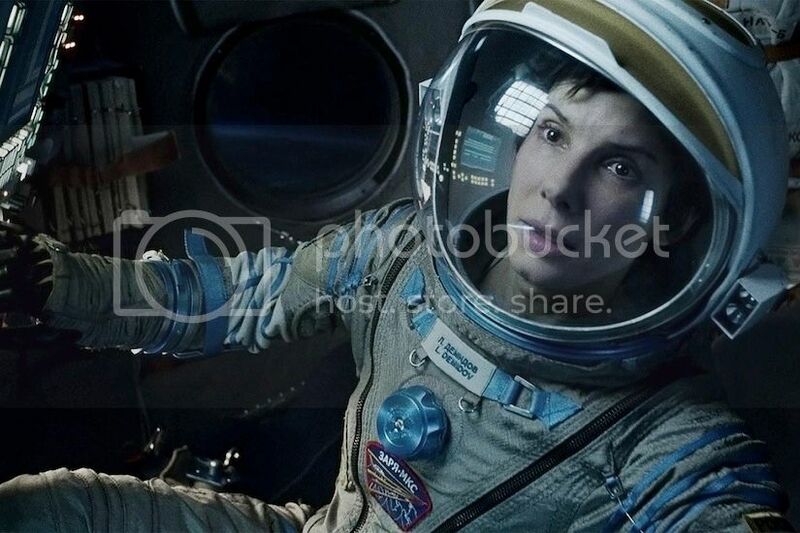 Sandra Bullock managed to carry the rest of the film on her own perfectly well. She really gave an outstanding performance. We see how her character Stone overcomes challenges after challenges in order to survive and make it back to earth. And I like that scene where she gave up hope and was prepared to die in the Soyuz when Clooney's Kowalsky made a surprise return. My first thought was, What?! He did not die after all? It was quite unbelievable until, we soon realized that it's not real but all part of Stone's dream while she was unconscious. Kowalsky's return to motivate Stone is a nice touch in the movie. I love it! Because of him, Stone finds new strength and eventually succeeds to return to earth alive. I would like to think that Kowalsky's spirit did really visit Stone and strengthen her will to live. For one and a half hour, I was transported into space. It was as if I was there with both Stone and Kowalsky. The cinematography was excellent. The storyline was engaging. The acting was superb. Perhaps the only problem I find with the movie is the seemingly ease of hopping from one space shuttle or space station to another. Is that even possible in real life? I thought the Hubble Telescope and the ISS are at different orbits! And also, we should not be able to hear those explosions in space right? I was also quite amused that Stone is able to drive the Shenzhou capsule towards the end of the movie when all the control buttons are in Chinese. The fact that she did a eenie-meenie-minee-moe on those buttons and somehow hit the right ones were laughable. Oh well, there are probably many more scientific flaws with this movie but I guess, movies are made to entertain and as long as they are entertaining, I don't mind overlooking those factual errors. Whatever it is, do not miss Gravity - undeniably one of the best movies this year!